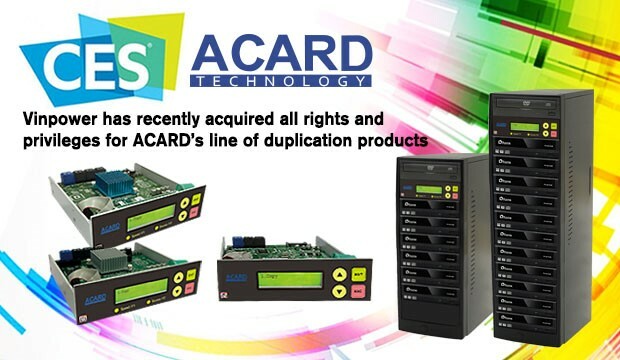 At one time, ACARD was the biggest name and leader in terms of global sales for duplication controllers. They had a huge advantage in their ownership and ability to develop and produce their own IC chips with their proprietary software installed. In owning the design and production of their own IC chips, made the cost of their controllers nearly half of everyone else’s, giving them a significant price advantage. That was a key reason that ACARD was able to become the leader in controller sales. However, due to mismanagement and poor decisions, the company eventually fell into financial disarray and ceased operation. Vinpower, being the leading supplier of duplication hardware, including our own proprietary controllers, saw a great opportunity to enhance our own product offering as well as improve our future product lines by acquiring the full line of ACARD’s duplication technology. Throughout and lengthy and often tenuous negotiations, Vinpower finalized the acquisition of ACARD’s duplication product and technology division the end of 2018, just in time to make the announcement of the acquisition during the 2019 CES tradeshow in Las Vegas. With ACARD’s IC technology, Vinpower will be able to both offer future improvements and lower costs for our duplication product lines as well as new products that were previously too costly to develop. For those of you that were able to visit with us and see the new ACARD product offerings first hand, I hope you were impressed by the future product map for Vinpower through the blended technology. For those who were not able to attend CES, we look forward to speaking with you in the near future to update you about our plans and the offerings that may be beneficial to both of us. For more information about the ACARD product line or any of Vinpower’s current or future product lines, please visit our website, www.vinpowerdigital.comor speak with a Vinpower representative for your region.